The Ghana Savannah Accelerated Development Authority (SADA) Millennium Villages Project (MVP) formally closed at the end of December 2016. However, a three-month no-cost extension enabled a core team of project staff to be maintained to work on completing the process of handing over to the Government of Ghana. SADA subsequently took up the financing of a further nine months of the core team’s work to enable them to tease out relevant lessons and to facilitate the mainstreaming of lessons by local authorities. 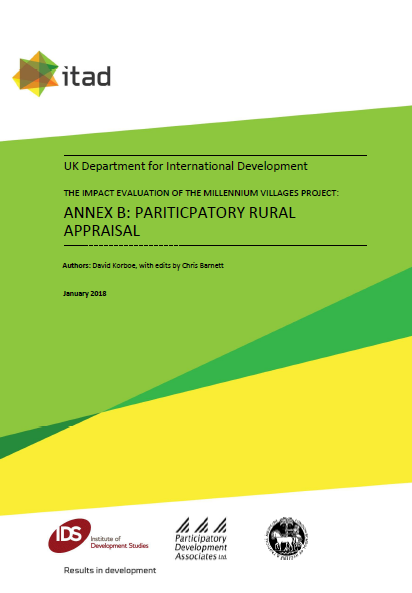 This participatory rural appraisal (PRA) provides a qualitative assessment of the MVP from the perspective of people living in villages in the area – both in the project’s Millennium Villages (MV) and control village (CV) sites. The report draws primarily on focus groups with different socio-economic strata in each of the villages selected, and brings together their perspectives of change (their lived reality). This study complements the findings of the statistical assessment of impact.